Pharmaceutical giant Shire will recommend a revised £46bn ($64bn) takeover offer by Japan's Takeda Pharmaceutical to its shareholders. The development marks a breakthrough in the takeover talks which included five offers by Takeda since late March. The sweetened cash and stock offer would provide $30.33 in cash for each Shire ordinary share. If approved by investors, the acquisition would be the largest takeover by a Japanese firm. Shire shareholders would own nearly half of the combined company and the new Takeda shares would be listed in Japan and the US, the Irish drug maker said in a statement. The firm added that it was setting a new deadline of 8 May for the negotiations to be concluded and said that could be extended further, if needed. The preliminary deal takes Takeda a step closer to its goal of becoming a global pharmaceutical company able to compete with US rivals such as Pfizer. 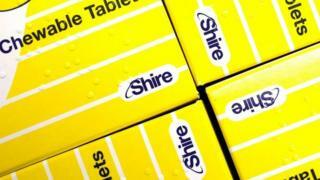 The Japanese firm is interested in acquiring Shire to strengthen its cancer, stomach and brain drug portfolios. Takeda shares fell 9% before rebounding slightly on Wednesday, as investors remain sceptical about its ability to fund the transaction. But if it goes ahead, the takeover deal will rank as one of the largest pharmaceutical acquisitions ever and could spark renewed interest in such mergers. Last week Shire said it was selling its cancer treatment unit to France's Servier for £1.7bn in a deal that was initiated in December. The firm said that acquisition was unrelated to the possibility of a takeover by Takeda.